Uzziah (עֻזִּיָּהוּ in Hebrew, meaning Yahweh is my strength; Greek: Οζίας; Latin: Ozias), also known as Azariah (עֲזַרְיָה in Hebrew; Greek: Αζαρις; Latin: Azarias), was the king of the ancient Kingdom of Judah, and one of King Amaziah's sons, whom the people chose to rule after his father (2 Kings 14:21; 2 Chronicles 26:1). 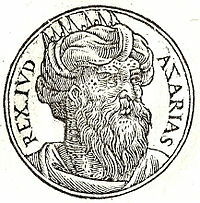 He was 16 years old when he became king of Judah and ruled for 52 years. He "did that which was right in the sight of the Lord" (2 Kings 15:3; 2 Chronicles 26:4-5). According to the Bible, at first he was a good king and had great success. His fields and vineyards grew well, he dug many wells and towers in the desert, he defeated his enemies with a strong army, and he became very powerful. A seal with Uzziah's name has been found in a cistern at Tell Beit Mirsim. However, he grew proud, and entered the temple of the LORD to burn incense on the altar of incense (2 Chronicles 26:15-16). Azariah the priest with 80 other priests came to him and said, "Leave...for you have been unfaithful...you will not be honored by the LORD God". Uzziah became angry, but while "...he was raging at the priests...leprosy broke out on his forehead", and he "...had leprosy until the day he died". Because of this, his son Jotham ruled the palace and the people of the land. He died and was buried in a field that belonged to the kings. Probably because of his leprosy, Uzziah was buried in a cemetery belonging to the kings, but not in the tombs of the kings. ↑ 2.0 2.1 2.2 2.3 2.4 2.5 2.6 The NIV Study Bible. Grand Rapids, Michigan 49530, USA: Zondervan Publishing House. ISBN 99 00 01 0201 9 Check |isbn= value: length (help). This page was last changed on 18 January 2018, at 22:51.